One of the more sought after topographical maps produced by the U.S. Geological Survey. The 1900 edition of the U.S.G.S. 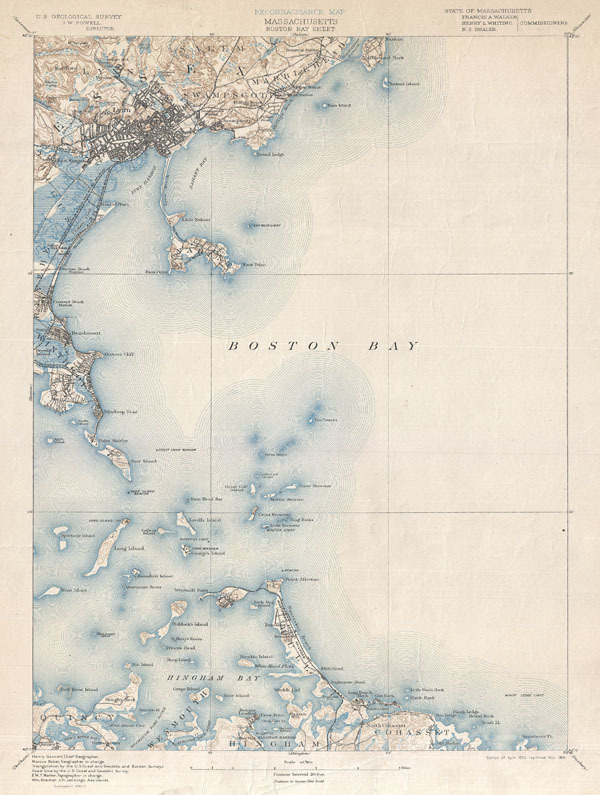 Survey Map of Boston Bay covers from Salem to Waymouth, Hingham and Cohasset. Offers extraordinary detail to the level of streets and often individual buildings. Includes Boston area communities of Marblehead, Lynn, Swampscott, Lynn, Salem, Revere, Winthrop, Quincy, Weymouth, Hingham, Hull and Cohasset. Identifies numerous other points of interest including Windmill Point, the Narrows Lighthouse, the Dear Island Beacon, the Great Fawn Beacon, the Minot Ledge Light House, the Egg Rock LIghthouse, and countless others. Prepared by Henry Gannett, E.W.F. Natter, J. H. Jennings, and Marcus Baker in 1887. Rumsey 2883.032. Phillips (Atlases) 1801. LeGear, Clara Elgi, United States Atlases, L1552.